Protocol stack software for telecom and data communications protocols in source code. Also video and audio codecs. Provide a HTTP protocol network sniffer, packet analyzer and file rebuilder. It is dedicated to capture IP packets containing HTTP protocol, rebuild and save the HTTP communications and files sent through HTTP protocol. Protocol overview and configuration information. A slide show by Paul Ferguson covering the BGP protocol. SCSI and Fibre channel protocol analyzers, test equipment and diagnostic software. An in-depth description of the AppleTalk protocol. Intended for those providing network support to Macs operating in a non-Mac environment (IP, and IPX) Offers articles, guidelines, and links. Rick Osbornes thoughts and ideas about the workings of the Gnutella protocol. Provider of test systems and networking tools supporting Fibre Channel, USB, 1394, Gigabit Ethernet, PCI-Express, SCSI, Escon standards, Protocol Analyzers and testers. Windows tool identifying codecs in container formats like AVI, MPEG and MP4. Large collection of codecs, software for video processing. Andy Oram article discussing P3P as a social protocol, as well as his views of the motivations behind the protocol. Internet Protocol is your one-stop source for all of your networking and web hosting needs. Multiprocessor WAV/MP3 to WAV/MP3 converter that uses Windows audio codecs, LAME and Blade encoders. News and information on tools and players with a discussion forum and tutorials. Provides public group comparisons of several AAC codecs and other formats at different bitrates. Contains links to current IEEE1284 resources including integrated circuits, cables, interface cards and protocol analyzers for the IEEE1284-1994 bi-directional PC parallel port specification. Klos Technologies specializes in protocol analyzer tools and network protocol stack (PPP, TCP/IP, IPX) development. Providing applications, codecs, and general information related to this audio format. The site also includes a forum for developers. FutureRIP (Routing Information Protocol) software is a portable implementation of the industry-standard RIP routing protocol. Offers a free movie community as well as downloads, codecs, players, software, guides, news and general information. Hardware manufacturer of the Zephyr ISDN codecs for radio and television broadcasters providing articles and brochures about different AAC implementations. This site hosts the Enigma Codecs. Free Javascipt based encryption. Links to video codecs, discussion board, frequently asked questions on viewing movie files. If the business hours of Agora Laboratories in may vary on holidays like Valentine’s Day, Washington’s Birthday, St. Patrick’s Day, Easter, Easter eve and Mother’s day. We display standard opening hours and price ranges in our profile site. We recommend to check out agoralabs.com/ for further information. 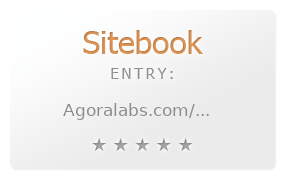 You can also search for Alternatives for agoralabs.com/ on our Review Site Sitebook.org All trademarks are the property of their respective owners. If we should delete this entry, please send us a short E-Mail.